Read the Municipal Democracy Report Card for the status of each municipality's deliberations on placing a non-binding referendum question on the ballot leading up to the November 15, 2014 election. Which municipalities valued their residents' opinions and which did not? 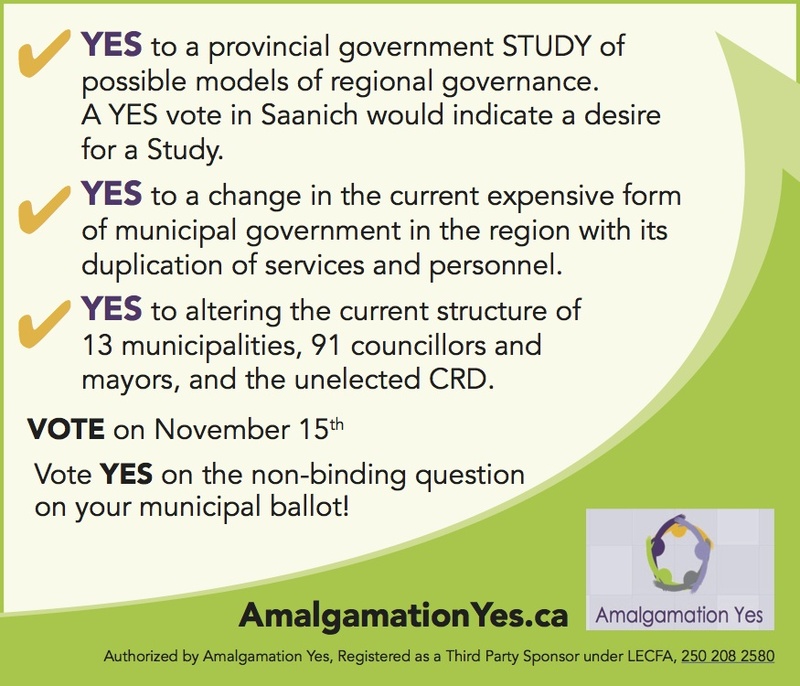 Read the Summary of all candidate responses to the Amalgamation Yes Questionnaire See at a glance how the candidates responded to each question. NOTE: The quotes below are from incumbent mayors and councillors. Do you favour some form of municipal amalgamation? "Amalgamation may (emphasis on uncertain) bring better regional planning and some more accountability for shared services, but has historically also raised costs and reduced access to government. Pretending either the current system is perfect or that amalgamation would solve most problems is unrealistic. For those that complain about the "cost" of 13 mayors, councils, and staff, I can speak for our municipality with details: of the $50,148,415 in the 2013 budgeted revenue, $96,953 is being spent on Mayor and Council, hardly the core problem. I like the trend towards shared services, I think a lot of efficiency can be found there. I think the CRD should be pared back to more utilitarian services (does it really need a full PR department plus outsourced PR consultants?). I also think that all communities have an obligation to support services in the core of Victoria. We have a great community, but the job of all politicians should be keeping an open mind to ideas on ways of improving it, be they radical or incremental.